Q: Lewis, a sensational win, congratulations. How do you feel today? Lewis HAMILTON: Wow, you got some bling! Where's this from? Q: Yeah, look at this. It's a 500 winner's ring. Hamilton: I love that! I need that ring! Hi, everyone. We've had such a great crowd here this weekend. In Japan they always look after us so well here, so very, very grateful for that, and the support has been immense. So, it's great to have a beautiful day here, it's probably the first time I've really seen the sea from here. The track was fantastic; the team did an incredible job. Max drove an outstanding race and honestly it wasn't an easy one for us at all. Q: You had a sensational lap, breaking the track record yesterday, but it didn't look like you had an easy afternoon today. At one stage Max was coming on a charge. How did you manage that, were you just calm, were you just controlling the situation? Hamilton: Yeah, I mean, today... the Red Bulls just seem to be rapid in race trim. Obviously we're quick in qualifying trim. But still I was able to just hold him behind. But it definitely got very close a couple of times, particularly at the end with the VSC and then when we restarted the tyres were cold, I had a bit of traffic, so he caught right up, so it was very, very close. Q: Well done, congratulations. Max, congratulations, a fantastic charge. Obviously [last weekend] in Malaysia you had a sensational win and look at your fans here in Suzuka, you're charging almost to a win. How do you feel today? Max VERSTAPPEN: Yeah, it was a great day again. I think Suzuka is great to me. I really love the track, already last year. I think the pace today was really promising. The first stint on the supersoft I was struggling a bit with the left front, but as soon as we switched to the soft tyre it was actually very competitive and I was always with Lewis and especially in the last few laps I think we had great pace. It's just really hard to pass. The last two or three laps I gave it my all to try to try to close the gap. But we had a really good day again and the car is definitely improving race by race and I'm really happy about that. Q: Fantastic Max, congratulations again. Daniel, you look a happy boy. Suzuka fans, says hello them maybe? Daniel RICCIARDO: Yeah, this is my first podium here. My objective this weekend was get a Suzuka podium and I have it and it feels great, so arigato. 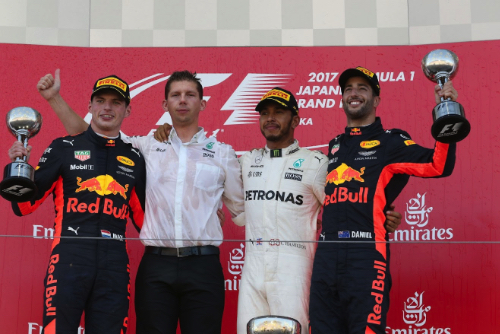 Q: You mentioned that this is your first podium at Suzuka. Obviously this is a track you love and this is your ninth podium of the season. You're looking strong. At the end you had a charge from the other guys, so how did you manage in the last few laps? Hamilton: Can I try this ring? Can I just see if it's worth me going and doing [the Indianapolis 500] one day. Can I try it? Q: Of course, anything for you. Lewis Hamilton with an Indy 500 winner's ring! Hamilton: It's pretty good. Congratulations. I was about to run! Q: The championship: you now have a massive 59-point lead. Obviously it was a little bit fortunate for you and a bit unfortunate for the red cars but there are four races to go, so what's the strategy, how do you feel about it? Hamilton: Yeah, honestly, I could only have dreamed of having this kind of gap. Ferrari have put on such a great challenge all year long. All I can really say is that I have to put it down to my team. They've done a phenomenal job, reliability has really been on point. They are just so meticulous and that's really why we have the reliability we have and the result we have been having. So a big thank you to the guys. I think a lot of them have already gone back to start packing up. But I owe it to everyone here and back at the factory and again the support that we get, it really does help lift us, so a big thank you to everyone. Q: Well Lewis, an emphatic victory in reality. Perhaps you could talk us through it in chronological order. Let's start with the start, who made the better getaway, yourself or Sebastian - and when did you realise he had a problem? Hamilton: The start was OK. It didn't feel initially the greatest but I think the initial getaway was not spectacular, there was a bit of wheel spin but then from then on, had a good start but I guess everyone around me, or at least Sebastian, had the same kind of thing. So, he slotted in behind me. Then it was pretty much under control from there, and then I saw that Max had done a big lunge into Turn 11, in my mirrors, so I just saw them drop back a step and really from then I was just trying to manage the pace, manage the tyres. It was a long way to go, the hottest the track had been all weekend - so it was really crucial, knowing that particularly the Ferraris and also the Red Bulls are very, very quick in the race, it was important in those moments that I looked after the tyres the best. Q: Was a two-stop ever a reality or was it always a one-stop as far as you were concerned? Hamilton: A one-stop was the way. There was no way we could make a two-stop work, and knowing the others would be two-stop, just missing a stop makes a big difference - but I think it was definitely on the limit with tyre life and tyre wear. Yeah, these guys seem to have a bigger wing: slower on the straights but much, much quicker, it seems, through the first two sectors, and particularly if he's right with me, he's able to follow. When I was with someone I was not able to follow. So, I guess under-winged for the mid sector and fine down the straight. Then it just got a little bit close towards the end. I had a comfortable gap going into the pit-stop and then I think Max did the undercut thing and gained a bit of time. Then my out-lap, I took it easy, just trying to look after the tyres again, so he closed up to 1.5 seconds and then after that I pulled it back out to two and a half or three seconds or something like that, so I was just controlling the pace but towards the end the VSC lost a lot of temperature in the tyres and waking them up was not so easy. Then I got traffic, I was stuck behind Fernando and I think it was Massa, at the time and I was just losing so much time. His car was so big in my mirrors. I was thinking 'Jeez, this is very, very close' with a couple of laps to go - but once I got by just managed to keep it together. So yeah, it was not an easy walk in the park today. It was very much one that I had to work very hard for. Great race by Max and enjoying racing with him. Q: And a 59 point lead in the World Championship now. Just one hundred on the table. One and a half hands on that championship trophy - how are you feeling about it? Hamilton: I think it's kind of unbelievable really, to think that we are where we are. I was excited actually to have a good race with Sebastian here, as I was in the last race - but he's obviously been incredibly unfortunate. In the world today, in Formula One it is a lot about reliability, it is about the team's whole performance, not just speed on the track, and I think the team has shown, through and through for many years now that we have a very, very solid platform. The guys do such a phenomenal job with how they build the car, in terms of reliability. Mercedes are the real leaders in that area and so I really owe it to everyone back at the factory for providing me with a car that I can utilise, and use my abilities in. So, big thank you to everyone back at the factory. There's still a long way to go. One hundred points is a lot of points. Anything can happen in life. I've just got to try and keep my head down and hopefully continue to perform like this - but I feel very, very fortunate and really blessed and enjoying the experience. Q: Max, coming on to you. We were getting excited at the end there. Was the win really on? What were you thinking in the car? Verstappen: difficult to say. I could see Lewis was managing his tyres and of course, with the traffic it just seems like it was a bit more difficult for him to follow other cars, compared to me. So I closed up - but also when you are really close you start to lose a lot of downforce, so I couldn't really attack him - but at least I tried. Before that, the start for me was very crucial. From there on I could basically do my own race. Once I got past Seb in the Hairpin I quickly realised that he had an issue, so that was good for me, of course, and yeah, the first stint, I think it was alright. I think Lewis was just a little bit faster and then after the pitstop we had great balance on the soft tyres and yeah, I just managed to keep it around 2.5s-3s. I didn't want to close-up more because then you destroy the front tyres. In case you maybe needed them at the end. So, yeah, I think the car lately in the race has been really competitive. I think like Lewis said, we have a bit more wing, so we are quite competitive through the corners. Of course, then on the straight we have an even bigger deficit than normal but it seems to work for us in the race so far, so yeah, of course happy to be here on the podium again. It seems like Suzuka is pretty good to me. Q: And concerns about that front-left, you mentioned. Verstappen: Well, it was all on the limit I guess - but for many people. Q: Daniel, your first podium here at Suzuka. You had your mirrors full of Valtteri Bottas at the end there, kept it exciting at least. Ricciardo: Yes, exactly. The race was pretty lonely after I lost out on the start. And then yeah, lost touch. Little bit like last week, lost touch of Max and Lewis and then it was just trying to do my pace. It was a bit lonely and then yeah, actually Valtteri coming at the end actually made it a bit more exciting for me. Made me feel pushed until the end basically. Kept it open. For the rest, I think there were parts of the race where our pace was pretty good but I think once the start is done here it's very difficult to overtake. You need a pretty big speed advantage. Front left, yeah, you could see it was wearing and getting a few blisters but yeah, the race itself, not very exciting but for sure I'm happy to be on the podium here. I said from the start of the weekend I wanted my first Suzuka podium and, yeah, I got it. Q: (Graham Harris - Motorsport Monday) Question for Max. You're on a charge in the last five laps and you came across the battle with Alonso and Massa. How did that affect you? Alonso cut right in front of you as Lewis went by him and you seemed to drop back a bit. Was that basically the defining moment that stopped your charge? Verstappen: Yeah, didn't help - but for me the last lap was more with Massa, but at the end of the day I think I wouldn't have passed Lewis anyway because it's really hard once he's in free air. It was more like when Lewis was getting held up then I could close up and then maybe you can do something but once he got past, even when I got held up, y'know, it's done. It's of course not ideal but it wouldn't have made a difference. Q: (Dan Knutson - Auto Action and Speedsport) Max and Daniel, you swapped positions at the start, could you just talk us through how that first little bit went? Verstappen: I think I had quite a good start and like Daniel said, it's really difficult to see in the mirrors but luckily we all had enough space afterwards so that was all good. Q: (Lennart Bloemhof - Volkskrant) Lewis, you said you enjoyed fighting with Max at the front. It's the second consecutive race now that that's happening. Can you tell us a bit more about that; how was it to fight against him? Hamilton: Yeah, I'm not letting this little... that was the kind of thought I was having. No, I'm enjoying being in an era with such great young talent coming through. He'll be here far beyond after I stop. But until then, I will try and not give him too many poles or too many wins. Q: (Luigi Perna - La Gazzetta dello Sport) Lewis, you now have a huge advantage over Sebastian Vettel. Will you change your approach in the next races or will you go to win anyway? Hamilton: To be honest, there's not really any need for me to change the approach. The points are still what you go out there to achieve but also you try and look after your car. I just don't think there's any need to make any changes. I'm not really particularly taking crazy risks in order to be in the position I'm in. So yeah, I think we're just going to try and continue to do what we're doing. Of course, we want to try and look after the car and the engine but I'm already doing that throughout the races so there's not really much more I can do and I think if sometimes you come off the gas a little bit you actually cause yourself more trouble than you need. Q: (Graham Harris - Motorsport Monday) Lewis, reliability is everything this year. On your cooldown lap you were talking to the engineers, speaking about vibrations. Is there anything possibly wrong with the engine or anything that might run over to Austin that needs changing? Hamilton: I don't think there's... I don't honestly think there's any wrong with the engine. I just felt a couple of things so I just... you just point out things that you might forget to tell them after this next meeting. You make lots of different switch changes and the turbos make strange noises and different vibrations come in, so I'm hoping there's nothing. I don't think there is anything, I think it was just low... shortshifting which the engine doesn't like so much. So I think that was it. Q: (Arjan Schouten - AD Sportwereld) Max, again a good result; what about the confidence in the car? Is the bad luck over now do you think? Verstappen: Confidence was always there, so now I'm finally having luck so that's good.